São Tomé and Principe islands lie off the coast of Western Africa, in the Atlantic Ocean. The islands are located in the Gulf of Guinea, about 300 kilometers off the coast of Gabon, just north of the equator. São Tomé and Principe is a member of the Paris Convention and the Madrid Protocol. The Industrial Property Law of São Tomé and Principe is silent on whether recognition is given to trade mark applications which are filed in terms of the Madrid Protocol which designate this country. It would appear, however, from the context of the provision in the Industrial Property Law which recognises and gives effect to São Tomé and Principe’s treaty obligations, that there was an intention to implement these treaties. Applications may be filed as national applications and, in appropriate circumstances, claiming convention priority in terms of the Paris Convention. International applications filed in terms of the Madrid Protocol may also designate São Tomé and Principe. No express provision is made for defensive marks. 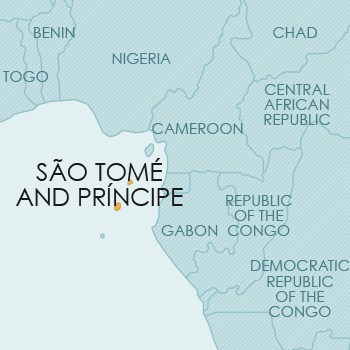 São Tomé and Principe is a member of the Paris Convention and the PCT. Patent protection is available via a national filing. Although São Tomé and Principe is a member of the PCT, the national laws have not yet been amended to cater for the PCT. Accordingly, it is not clear whether enforceable rights will be obtained via PCT national phase filings in São Tomé. The Law does contain a general provision to the effect that the provisions of any international treaty concerning IP to which São Tomé and Principe is a party, are applicable and supersede national law. This provision provides a basis for PCT applications. São Tomé and Principe is a member of the Paris Convention and the Hague Agreement. Although São Tomé and Principe has acceded to the Hague Agreement, the national law has not yet been amended to provide for international applications designating São Tomé. Accordingly, it is not clear whether enforceable rights can be obtained in that manner. The Law does contain a general provision to the effect that the provisions of any international treaty concerning IP to which São Tomé and Principe is a party, are applicable and supersede national law. Design protection is available by way of a national filing. São Tomé and Principe is not a member of the Berne Convention. In São Tomé and Principe, a law was passed in 1966 establishing the Code on Copyright. However, an English version of this law could not be obtained, and it is not clear whether the law has in fact been implemented. As indicated above, São Tomé and Principe has not yet acceded to the Berne Convention. Accordingly, no commentary on copyright could be given at the time of writing. It has not been possible to determine whether or not São Tomé and Principe has legislation or a protection regime for the protection of plant varieties.